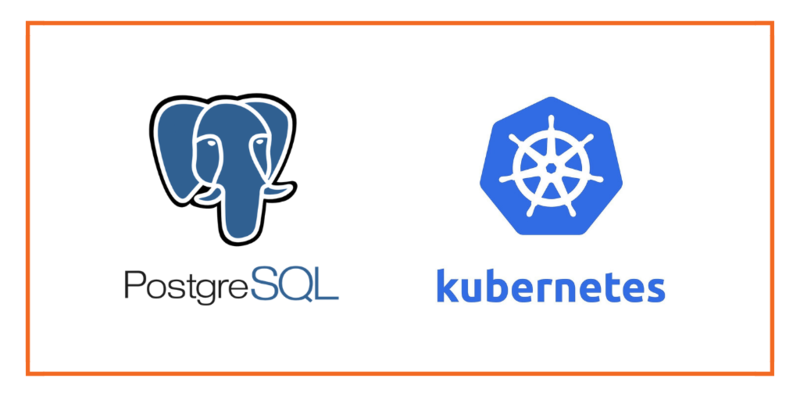 This post is part of our ongoing series on running PostgreSQL on Kubernetes. We’ve published a number of articles about running PostgreSQL on Kubernetes for specific platforms and for specific use cases. If you are looking for a specific Kubernetes platform, check out these related articles. Portworx is a cloud-native storage platform to run persistent workloads deployed on a variety of orchestration engines including Kubernetes. With Portworx, customers can manage the database of their choice on any infrastructure using any container scheduler. It provides a single data management layer for all stateful services, no matter where they run. 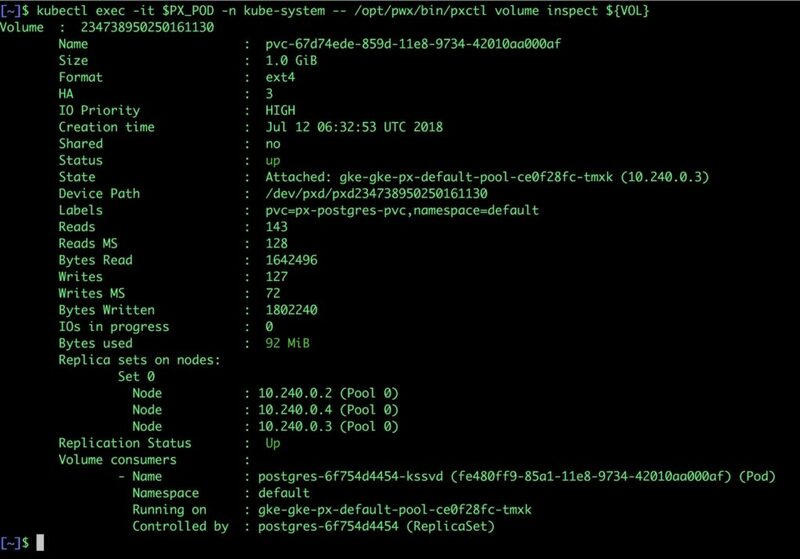 This tutorial is a walk-through of the steps involved in deploying and managing a highly available PostgreSQL cluster on Google Kubernetes Engine. Installing Portworx on GKE is not very different from installing it on any other Kubernetes cluster. Portworx GKE documentation has the steps involved in running the Portworx cluster in a Kubernetes environment deployed in AWS. Once the GKE cluster is up and running, and Portworx is installed and configured, we will deploy a highly available PostgreSQL database. Through Storage Class objects, an admin can define different classes of Portworx volumes that are offered in a cluster. These classes will be used during the dynamic provisioning of volumes. The Storage Class defines the replication factor, IO profile (e.g. for a database or a CMS), and priority (e.g. SSD or HDD). These parameters impact the availability and throughput of workload and can be specified for each volume. This is important because a production database will have different requirements than a development Jenkins cluster. In this example, the Storage Class that we deploy has a replication factor of 3 with IO profile set to “db”, and priority set to “high”. This means that the storage will be optimized for low latency database workloads like Postgres and automatically placed on the highest performance storage available in the cluster. The password for PostgreSQL will be created as a secret. Run the following commands to create the secret in the correct format. Finally, let’s create PostgreSQL instance as a Kubernetes deployment object. For simplicity sake, we will just be deploying a single Postgres pod. Because Portworx provides synchronous replication for High Availability, a single Postgres instance might be the best deployment option for your Postgres database. Portworx can also provide backing volumes for multi-node Postgres deployments. The choice is yours. Make sure that the Postgres pods are in running state. Wait utill the Postgres pod is in running state. 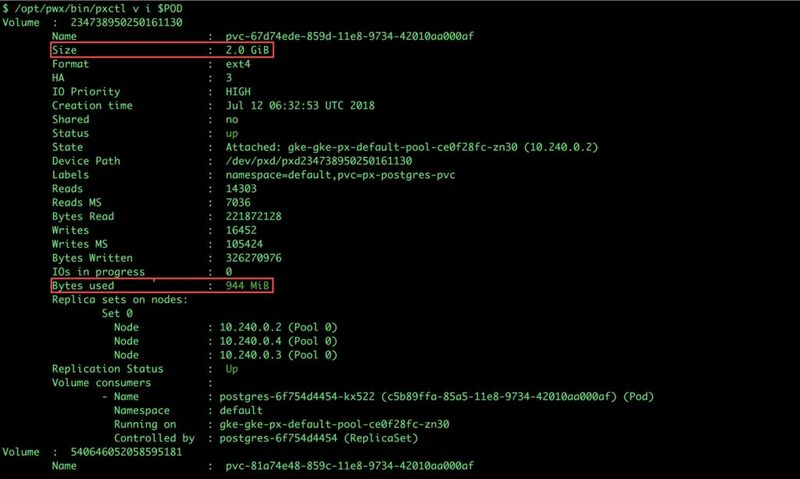 We can inspect the Portworx volume by accessing the pxctl tool running with the Postgres Pod. The output from the above command confirms the creation of volumes that are backing PostgreSQL database instance. Let’s populate the database will 5 million rows of sample data. We will first find the pod that’s running PostgreSQL to access the shell. Now that we are inside the pod, we can connect to Postgres and create a database. 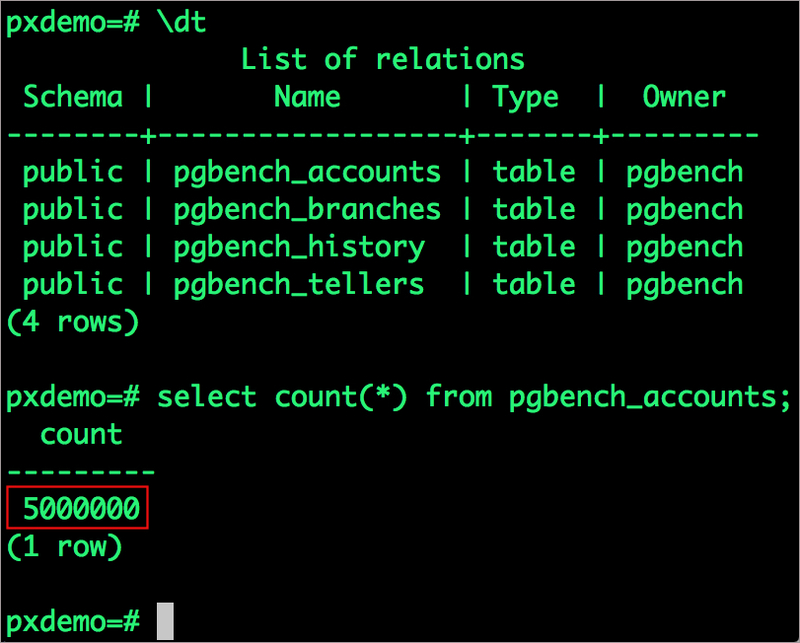 By default, pgbench will create 4 tables (pgbench_branches, pgbench_tellers, pgbench_accounts, and pgbench_history) with 100,000 rows in the main pgbench_accounts table. This creates a simple 16MB database. The -s option is used for multiplying the number of rows entered into each table. In the command below, we enter a “scaling” option of 50. This tells pgbench to create a database with 50 times the default size. What this means is our pgbench_accounts table now has 5,000,000 records. It also means our database size is now 800MB (50 x 16MB). 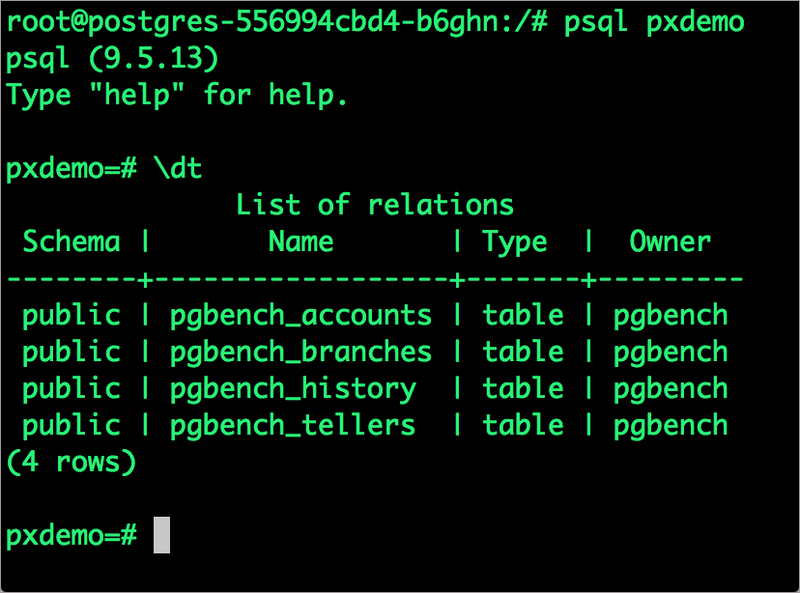 Wait for pgbench to finish populating the table. After that’s done, let’s verify that the pgbench_accounts is populated by 5 million rows. 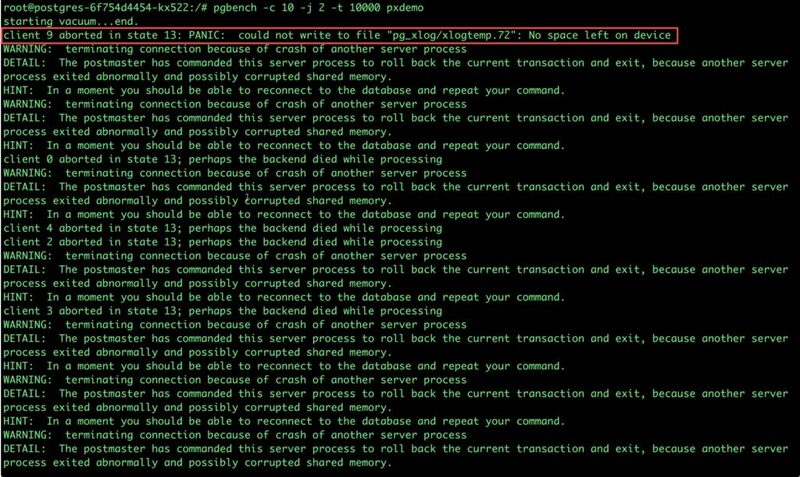 Now, let’s simulate the node failure by cordoning off the node on which PostgreSQL is running. Executing kubectl get nodes confirms that scheduling is disabled for one of the nodes. We will now go ahead and delete the PostgreSQL pod. As soon as the pod is deleted, it is relocated to the node with the replicated data. STorage ORchestrator for Kubernetes (STORK), Portworx’s custom storage scheduler allows co-locating the pod on the exact node where the data is stored. It ensures that an appropriate node is selected for scheduling the pod. Let’s find the pod name and exec into the container. Now use psql to make sure our data is still there. Observe that the database table is still there and all the content intact! After testing end-to-end failover of the database, let’s perform StorageOps on our GKE cluster. We will now run a bigger benchmark to run out of space to show how easy it is to add space to a volume dynamically. Open a shell inside the container. Let’s use pgbench to run a baseline transaction benchmark which will try to grow the volume to more than 1 Gib and fail. There may be multiple errors during the execution of the above command. The first error indicates that Pod is running out of space. 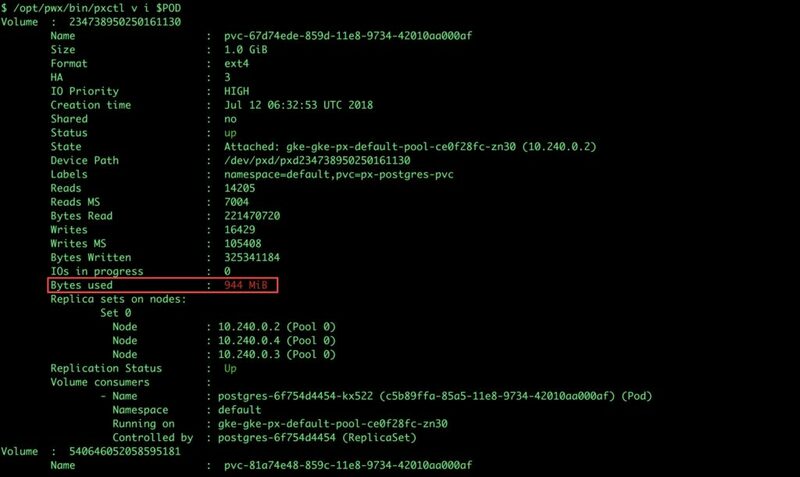 Since Kubernetes doesn’t support modifying the PVC after creation, we perform this operation directly on Portworx with the pxctl cli tool. Let’s get the volume name and inspect it through the pxctl tool. Notice that the volume is within 10% of being full. Let’s expand it using the following command. Portworx can be easily deployed on Google Kubernetes Engine to run stateful workloads in production. Through the integration of STORK, DevOps and StorageOps teams can seamlessly run highly available database clusters in GKE. They can perform traditional operations such as volume expansion, backup, and recovery for the cloud-native applications is a automated and efficient manner.